During the school year, we encourage children and youth to begin Sunday mornings by joining their parents in worship. After the Children’s Story, ages 0-2 are invited to the Nursery, age 3-Grade 5 are invited to participate in Godly Play classes and Grades 6-12 are invited to participate in Discussion in the Upper Room. On Communion Sundays, children return to worship to participate in the sacrament of the Lord’s Supper with their church family. 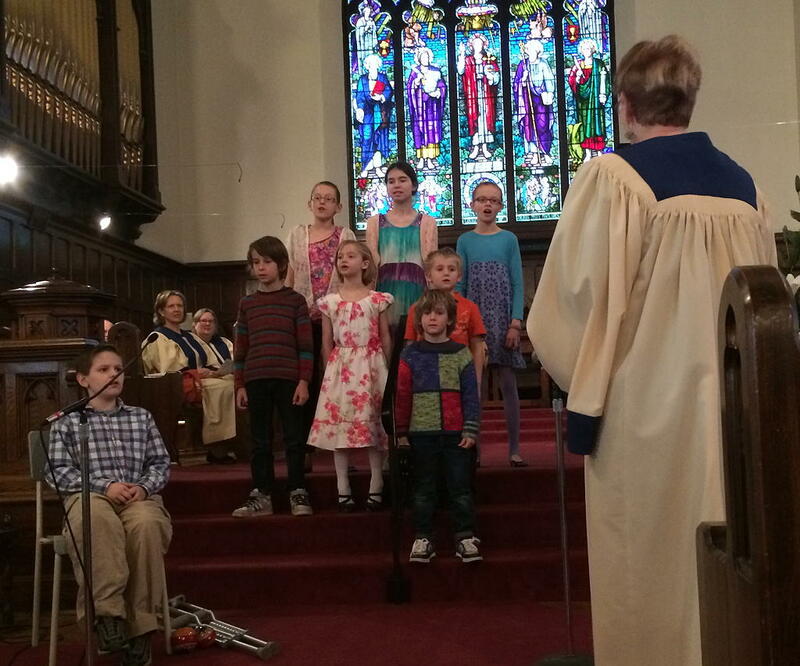 In summer, we encourage children to participate in worship with their families. Activity packs can be picked up at the back of the sanctuary to help younger children pass the time. We also offer child care for the youngest ones in the Nursery (birth-those finishing Grade 2). 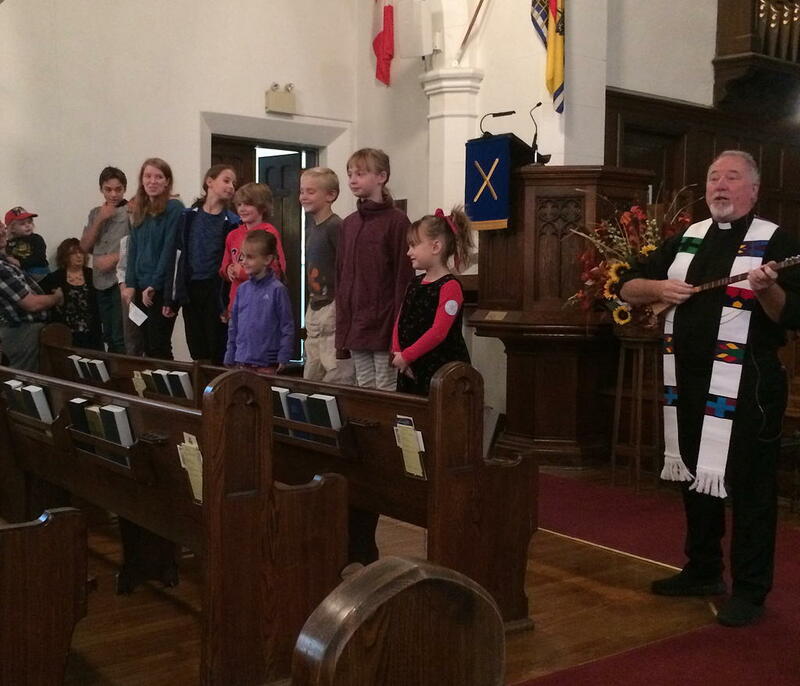 Children and youth also participate in services throughout the year by reading scripture, greeting, receiving offering or singing in the Children’s Choir. 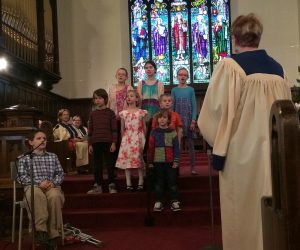 Each December, on the third Sunday in Advent (Joy Sunday) and each June on Youth and Graduate Sunday, children and youth take significant roles in leading the worship service. Nursery Care is available for children up to two years of age. Parents and volunteers from our congregation take turns supervising in the Nursery each week. These volunteers do their best to ensure a loving environment for our youngest members. Parents are welcome to settle their child into the nursery before worship starts, take their child to the nursery when the older children leave for church school or take their child to the nursery at any time during the service, if need be. We also have two rocking chairs at the back of the sanctuary and a selection of picture books, should that be helpful. We at Saint Andrew’s are excited about our Church School. Children are engaged in the Godly Play program, which is supported by our Christian Education Committee and run by volunteer Storytellers and Doorkeepers. Special places have been created at Saint Andrews so that our children can experience worship in such a way that they can grow in their love and knowledge of God. Age 3-Grade 2 children make use of our Godly Play room in the downstairs and youngsters Grade 3-Grade 5 have their own Godly Play room upstairs. Godly Play draws on the traditions of ancient storytelling. Teachers model how to use the language of the Christian tradition through presentations of parables, sacred stories, liturgy and silence. The Godly Play classroom provides a space to worship God, not just speak about God. Once each child is welcomed to their classroom, the candle is lit and the story is told. After a time of exploring the story with wondering, the children choose the way they want to respond and then spend some time responding to what they feel is most important to them in the story, using art materials, or working with the Godly Play story materials. Even very young children can bring their daily life experiences to God by retelling the stories. In this way, their “play” in guided in a Godly way. After the response time, children are invited to clean up their space and rejoin the circle for the prayer of thanksgiving and the feast. After sharing in the feast, a blessing is offered before saying goodbye. During Church School, parents are welcome to stay with their children but they are also welcome to return to worship. Each Sunday during the school year, except Communion Sundays, the Grade 6-12 youth meet in the Upper Room to talk about the Bible, the church, their lives and the world around them.. This group of young people are encouraged to give of their time within the church and out in the larger community. Every month our Middle and High school students get together for a fun and fellowship event. Past events include bowling, laser tag, indoor snowball fights, downtown photo scavenger hunts, overnighters and more. They often have pizza, and always have a good time. There is also an active college and career group which meets once a month. Good food and fellowship are always in abundance. Drives are arranged for those who need them, and diets are accommodated. All youth events are led by our Director of Youth and Young Adult Ministry. On the Friday evening before the first Sunday in Advent everyone is invited to join us from 5-7pm for a time of celebration and preparation for the Advent season. Pizza is provided from 5:00-5:30pm. We then set up Christmas trees, decorate cookies, do a take-home craft, hear a story, colour angels and we top it off with a short time of carolling before we go home. This is our Atlantic Synod camp found in beautiful Merigomish, Nova Scotia. Its purpose is to develop Christian faith and character in children and youth through living together in a camp community, and to further the educational goals of the church in an outdoor setting. It is open to all youth and to all denominations.